Be sure to avoid added sugars in products not intended to taste sweet, such as tomato sauce, soups, breads, or frozen waffles. Whenever possible, choose foods that contain natural sugars such as fruit juice. Although not all nutrition professionals agree that some types of sugars are better than others, I recommend choosing food sweetened with sugar instead of food sweetened with high fructose corn syrup (HFCS). Recent research shows a considerable correlation between high fructose corn syrup and obesity. Because of the way it is digested, high fructose corn syrup does not stimulate insulin secretion, a process that tells your body that calories have been consumed. When insulin is not secreted, overeating is more likely. And this can result in weight gain over time. Even though sugar is a better choice, keep in mind that too much sugar of any kind introduces lots of calories, but few nutrients, into the body. It’s better to enjoy sweet treats that are naturally sweet, high in fiber and complex carbohydrates such as fruit salad and healthy versions of desserts like apple pie with whole wheat crust. 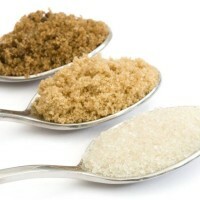 Read more on sugar and test your knowledge with Super Crew’s® kid Carlos and the Sugar Mystery. This is a great article. Only because I’m short on time, but when I return I’ll be forwarding this piece to my friends. I am constantly trying to stress the importance of how much sugar is in products that aren’t for dessert! I finally found a couple of organic breads that do not include any form of sugar–hard to do at the major food chains (call include high fructose corn syrup). The organic bread sold in two packs at Costco is awesome–no sugar and all wholesome ingredients (maybe five ingredients) and no soy–of any kind including soybean oil. I can’t wait for more time to browse other articles. This site’s being bookmarked. Get the Whole Family Moving with Chores!